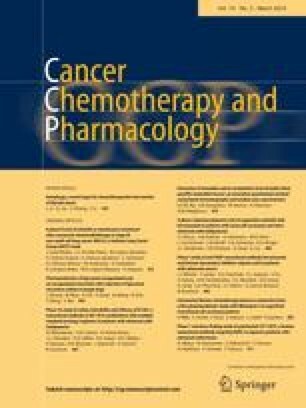 Progress in molecular pharmacology has demonstrated each anticancer drug to have a unique molecular target. Recent drug development has focused on compounds that specifically inhibit and/or modify tumor-specific molecular biological changes (target-based drug development). These compounds are generally classified as either small molecules or macromolecules. With the exception of antibodies, the majority of recently developed target-based drugs are small molecules. Assessing the effects of these compounds on their targets would probably help researchers to predict the antitumor effects of these anticancer drugs; however, actually assessing this hypothesis, even in preclinical models, is difficult. Most preclinical experiments attempt to show tumor growth inhibition or shrinkage, leading to a longer survival period or higher cure rate. Few experiments have examined the correlation between antitumor activity and the effect of a compound on its target. In phase I clinical trials of target-based drugs, the determination of maximum tolerated dose is not enough; the effect of the drug on its target should also be evaluated. Recently, dose-escalation strategies based on the effects of drugs on their targets have been proposed, even though an appropriate target effect is necessary but not sufficient to demonstrate clinical efficacy. Compounds that are not specifically directed against molecular targets on or within tumor cells, but against blood vessels, matrix, etc., usually do not cause tumor shrinkage. These compounds include angiogenesis inhibitors and matrix metalloproteinase inhibitors and are usually used in combination with other treatments at the start of clinical trials. Whether the methodology of clinical trials is sensitive enough to detect the subtle effects of these compounds remains uncertain. The effects of experimental drugs on their targets are rarely examined in clinical trials. Few data from translational studies are available and data obtained using surrogate tissues do not necessarily reflect the effects of the drugs on in situ tumors. Parameters such as time to progression, changes in tumor markers, and growth rates often vary significantly and are regarded as soft endpoints. Phase III trials evaluating survival benefit require extensive resources, including a large number of patients, a sophisticated data center, and well-trained study groups. The problems and future prospects of novel anticancer drug development are discussed. This work was presented at the 18th Bristol-Myers Squibb Nagoya International Cancer Treatment Symposium, "New Strategies for Novel Anticancer Drug Development," 8–9 November 2002, Nagoya, Japan. This work was supported by grants-in-aid for scientific research from the Ministry of Education, Science, Sports and Culture, and Ministry of Health, Labour and Welfare, Japan, and an educational grant from Bristol-Myers Squibb.